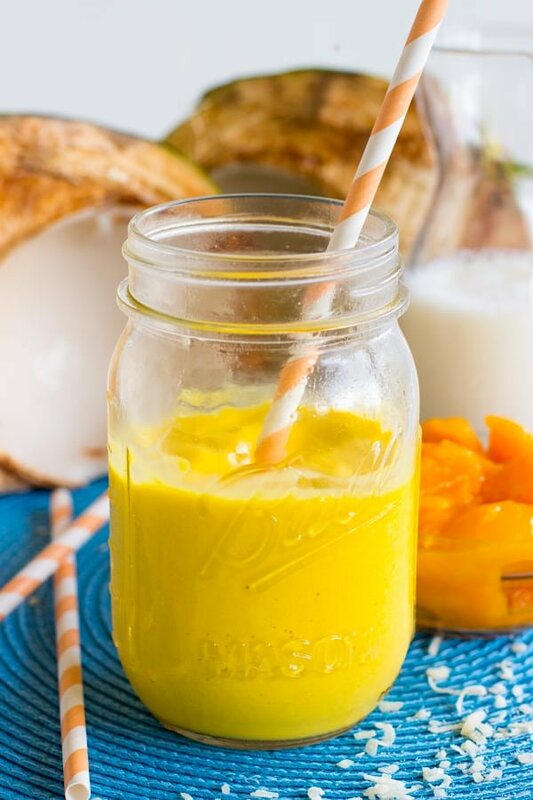 This Two Ingredient Mango Coconut Smoothie is incredibly delicious, smooth and creamy and perfect for summer! Since it’s 3 days until I get married (what!) you know that the fact that I’m blogging right now is for something super important. Whew! 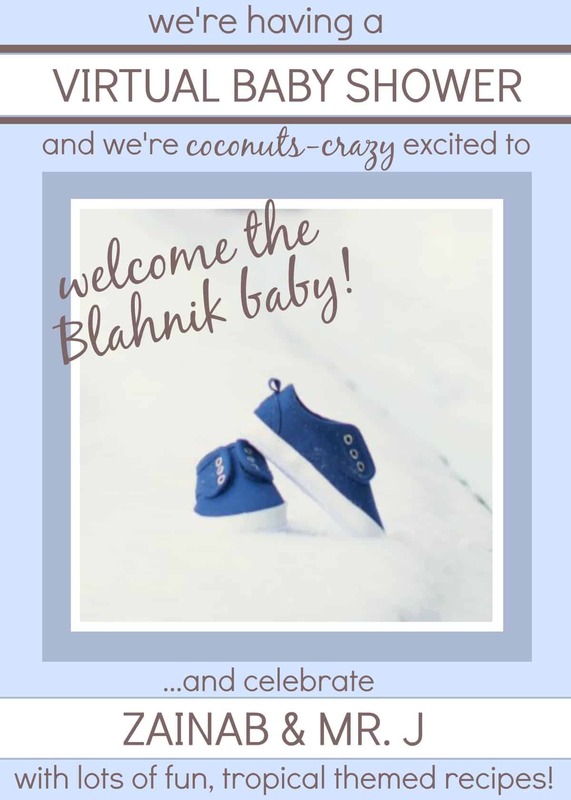 Z, I have to tell you, keeping this a secret from you was HARD but Happy Secret Virtual Baby Shower for Baby Blahnik! So, background story. Zainab (Z) of Blahnik Baker and I made a connection over a year ago over the blogosphere (could it be mutual love for food and fashion?) and ever since then we’ve had some pretty fun memories and long conversations, including sending numerous blog photos back and forth for help with title names or does this look a tinge too yellow to helping me finalise a new logo when I rebranded. Last year even we did a blogger gift exchange in which I sent Z a Jamaican themed package (Jamaican savoury and sweet foods authentic to Jamaica) and I just received such an adorable American themed package with gifts I use to this day – including a cute spatula and oven mitten set! Given our history, Z was naturally invited to my wedding which why I’m even MORE excited about how I found out she was expecting! She delivered the unfortunate news that she wouldn’t be able to make it to the wedding here in Jamaica…because she couldn’t fly so late…because…! I filled in the blanks immediately and told the Mr. Immediately (I’m known for being uber emotional re these things) and tears filled my eyes immediately. Z, I was and I am STILL so happy for you and Justin!! Of course we’ve been talking back and forth about wedding plans and baby plans so about a month ago why Allie from Baking a Moment, Jocelyn from Grandbaby Cakes and Alice from Hip Foodie Mom contacted me about participating in a surprise virtual baby shower, it’s fair to say I was just waiting on that email! Given that I’m writing this at 4:30 am during the only non-wedding filled time, Z you mean a LOT to me! So I’ve blabbed away, and it’s time for the recipe. 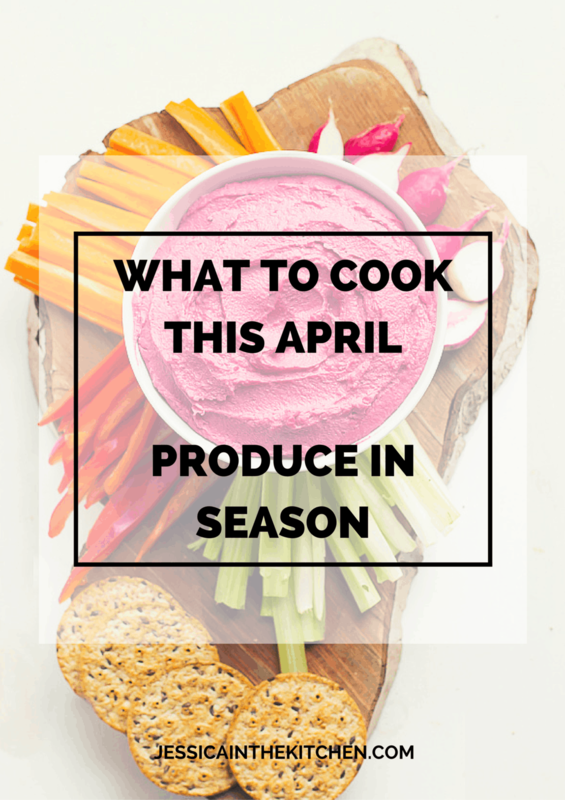 Sticking with the general coconut and tropical theme, I wanted a recipe that would be very very easy for Z to make when her beautiful bouncing baby is keeping her busy. A filling smoothie that could be made ahead of time came immediately to mind, and so the two ingredients Mango Coconut Smoothie was born! 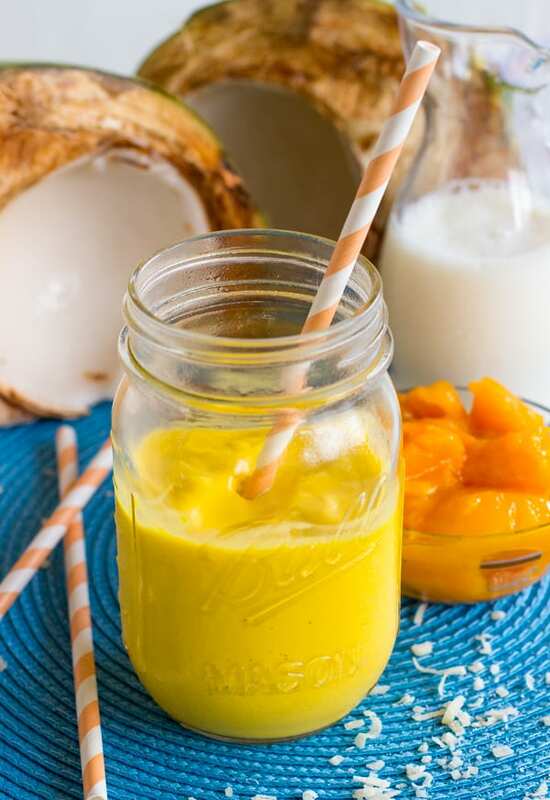 I’m very fortunate to have coconuts growing in my backyard and two mango trees, so making this recipe was a snap but pre-made coconut milk and bought mangoes work just as a fine. 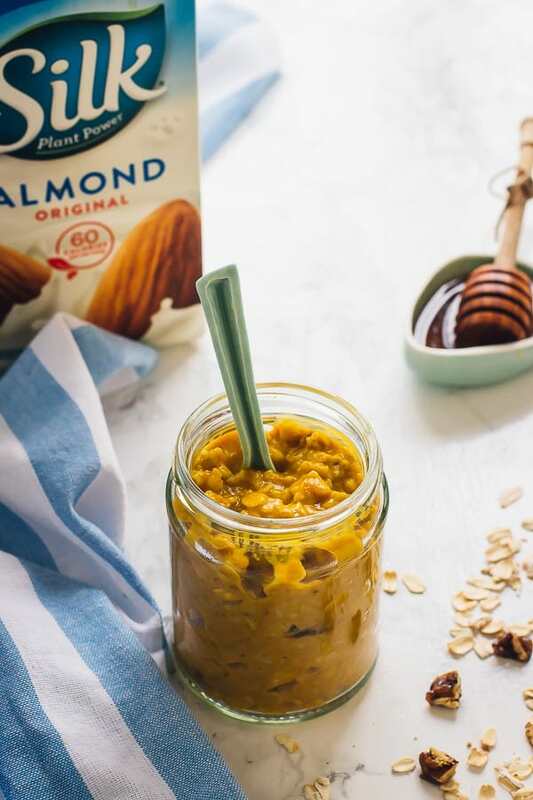 I honestly thought I would need to add more ingredients to this recipe but one mango later (depending on the size about ½ cup of chunks) and ¾ cup of thick, refrigerated coconut milk later I was sipping away in approval. This recipe is basically the definition of easy, breezy tropical! It’s so smooth and has a touch of creaminess to it but is very light as well. This would actually make a great tropical cocktail, which I would of course NEVER recommend for Z right now but you should save this tip in your archives! A ‘toops’ – Jamaican for basically a little bit – of coconut rum would take this up a notch. Z, I hope you enjoy my Mango Coconut Smoothie and every other one! We are all so happy for you and equally excited to be participating. Here’s to wishing you all the best with your beautiful little man – we’ll be in contact! In a blender, combine all ingredients. Blend until smooth, about 30 seconds. 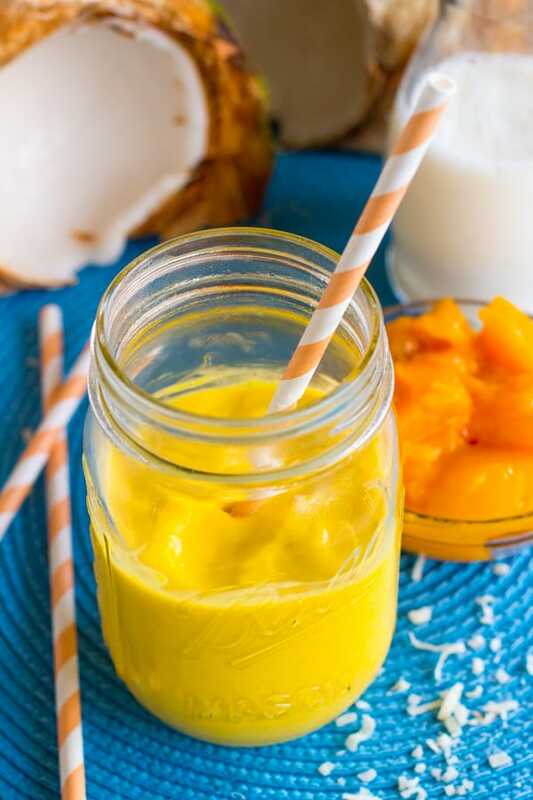 This Two Ingredient Mango-Coconut Smoothie is incredibly delicious, smooth and creamy and perfect for summer! I am loving seeing everyone’s posts for this virtual baby shower. 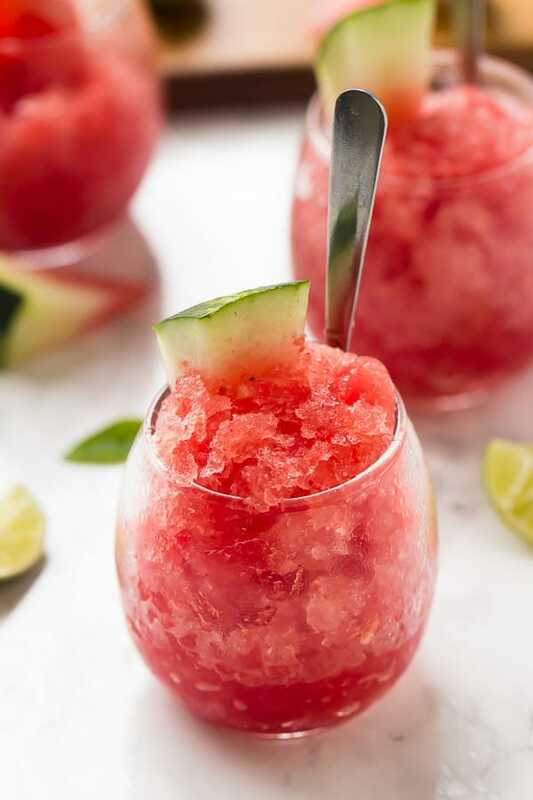 I could go a glass of this right now- it is so hot here. I hope you have an amazing time at your wedding. Enjoy every second! This is pretty much the prettiest smoothie ever! Awwww I hope you have an amazing wedding Jessica, take lots of pictures for us! I can’t wait to try this smoothie! I am still not happy I can’t make it your wedding this weekend but so glad you understand!!! I can’t even imagine you are blogging let alone celebrating me!! You are the best!! I love this smoothie so much and makes me miss home where my mango trees are waiting. Have a great wedding day on Saturday!!! You’re so welcome my friend! And thank you!! We loved our wedding!! This is seriously so beautiful. Thank you so much for being part of the love today! Aww Renee! Thank you so much!! It was so much fun!! What a beautiful post! And a delicious looking smoothie! And holy smokes, have a fantastic wedding!! Thanks so much Ashley! It was amazing!! I love how simple this smoothie recipe is! Sometimes the best flavors don’t need any help. Love this simple smoothie. It looks perfect for a hot summer day. AND it’s perfect for Z! Congratulations on your wedding!!! I’m getting married in August, so I can only imagine how excited you are right now!! This smoothie looks delicious and I loved reading about your relationship with Z! Happy Wedding Fun! Thank you Luci!It was so amazing!! And a huge congratulations to you for your wedding!! Thank you so much Jessica! It was amazing!! This smoothie sound perfect! I looks so thick and creamy! Happy wedding! Thank you Nancy! It was wonderful! So vibrant! And easy to make! 2-Yay for Z and her being the bestest momma and this wonderful smoothie! SO summery! Thank you Kayle! And Congrats to you too!! I can’t believe such a perfect, delicious smoothie is made from only 2 ingredients! Also, CONGRATULATIONS on your upcoming wedding!! I hope you have the most amazing day that exceeds your wildest expectations!! I’ll be thinking of you! Thank you so much Nora! It was a fabulous day! 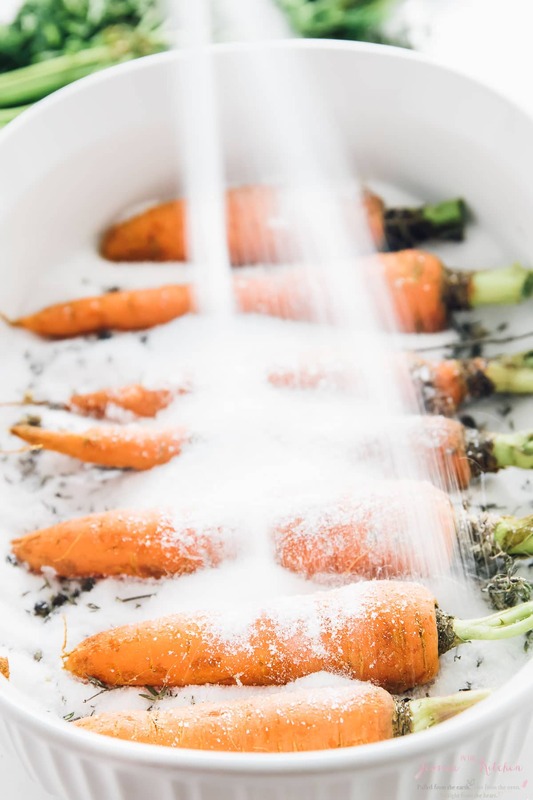 Love this smoothie, it looks fantastic and perfect for Z’s shower! Yay for wedding weekend, hope you have an amazing day! Thank you so much Kelly! It was amazing and so was our honeymoon! This IS the perfect smoothie for summer!!! love!!!! and thank you so much for joining the celebration!!! Mango is my absolute favorite smoothie ingredient lately. This drink looks so refreshing and awesome, I can’t wait to try it! Yeay for Z and your wedding (which looked marvelous on Instagram :)! This smoothie looks like tropical paradise! Thank you Amy and CONGRATS to you too!!! The color of this smoothie looks FANTASTIC! Perfect for summer and for the baby shower! Sounds really fantastic, can’t wait to give it a try. Mango is my favorite.